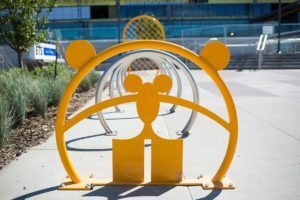 For the new LRT stations at NAIT and MacEwan University, students were invited to submit their designs for functional, artistic bike racks to enliven the commute. Five designs from six students were chosen. The MacEwan designs are by Alina Cross (NAIT), Chelsea Allan (NAIT), Morgan Wellborn & Chunyu Qi (MacEwan).